If you’re looking to give kayaking a go then our kayak taster sessions are perfect for you. Suitable for both kids and adults, our kayak taster days are designed for beginners to introduce you to the skills and techniques of paddling on a natural body of water. 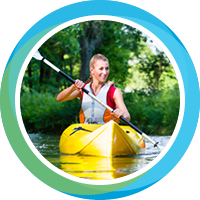 During the session your BCU qualified kayak coach will take through a series of land based exercises, teaching you essential kayaking skills before setting you out on the water. Throughout the activity session, the emphasis is placed on safe, enjoyable fun through progressive learning and confidence building. Kayaking is an exciting, competitive and recreational sport so, for our taster days we encompass all of these with a healthy helping of fun and adventure!